The Lake Campus hosted the regional launch of Rise. Shine. The Campaign for Wright State University on March 22. 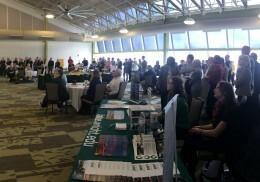 Wright State’s Lake Campus hosted a regional launch of Rise. Shine. The Campaign for Wright State University on March 22. Hosted by Wright State President David R. Hopkins, the afternoon brought over 100 faculty, staff and guests to James F. Dicke Hall to hear about future initiatives at the Lake Campus. The university launched the $150 million fundraising campaign in October 2014. Co-chairing the campaign is Academy Award-winner Tom Hanks and Amanda Wright Lane, great grandniece of university namesakes Orville and Wilbur Wright. The campaign promises to further elevate the school’s prominence by expanding scholarships, attracting more top-flight faculty and supporting construction of state-of-the-art facilities. The campaign has raised more than $111 million so far. Advanced manufacturing: Wright State envisions a world-class advanced manufacturing and robotics teaching center, developed with local partners to ensure and achieve new economic growth in technology and manufacturing in Ohio. Agribusiness and food science: The Lake Campus envisions support for key programs that reflect community and regional needs and is focused on technical and applied information related to the agriculture industry. Athletics and recreation: The Lake Campus envisions an athletic and recreation complex that would foster an environment that is conducive to: increased engagement of all students in campus activities; advancements in recruiting for all athletic programs; and a more enjoyable recreation experience offered by a student-run facility. Connector building: The Lake Campus envisions a multifunctional area with instructional and support service space connecting between Trenary and Dwyer Halls. This space will allow the Lake Campus to achieve the strategic goal of enhancing student access to and successful participation in higher education through quality and innovative instruction and programs. The space would include a library and learning center. Water quality research institute: The Lake Campus envisions a water quality institute that would foster innovation through: academic and industry collaborations and link research to address business, industry and community needs. Mathies said the five areas are not listed in the order of need or desire. “We certainly will pay attention to what students, faculty, staff, donors and our community are requesting,” she said. Hopkins also announced that Pat and Don Griesdorn, former Celina residents, agreed to sell 38 acres of land just east of campus to Wright State. For more information about the campaign or to donate, contact Julie Miller at julie.miller@wright.edu or 419-586-0375 or visit rise.shine.wright.edu.